Why does my crab act the way it does? One of the most interesting things about land hermit crabs is their behavior. Simply put, each hermit crab has its own disposition. In my crabitat, for example, I have the crabs Grouchy and Thankless Beast (or TB) who almost never come out of their shells, except to pinch me! But on the other end of the scale I have the crabs Friendly and Oprah who come flying out, antennae a-pattering about in greeting when I pick them up. What makes them so different? There are a few reasons your hermit crabs behave differently. We'll use my crabs Grumpy, Big Mouth and Attila as examples. Grumpy makes me eat my words! When I first purchased Grumpy, she was the last hermit crab left alive in a pet store tank full of dead crab bodies. Since she refused to come out of her shell for me in the pet store, I bought her, sight-unseen, out of sympathy. On the way home from the pet store, this small crab with very long antennae came out of her shell quickly, pinched me VERY hard on the palm and immediately went back into her shell. I did not see her come out of her shell again for the next month! Each bath day, I would pick her up and handle her on my palm for a little while and she would cautiously peek out and then slam shut in her shell. This went on for about three months until she finally realized I was not going to poke her or drop her (like the people in the pet store). Grumpy ended up being one of my most outgoing hermit crabs. Big Mouth is loved into silence! Big Mouth is a very special, soft-ball-sized jumbo hermit crab. I purchased Big Mouth from a Sunsations store in Ocean City, Maryland during the 2001 Crab Convention. Poor Big Mouth was one of about six jumbo crabs crammed into a small wire cage. The pet store employees refused to allow me to handle him until I showed them my Hermit Crab Association business card. Then I picked him up out of the cage. As soon as he realized he was being picked up, he started chirping loudly! Big Mouth is a very large hermit crab and purple-claw crabs of his size do not normally chirp unless they are intimidated, which is rare for a crab of that size. But there he was, chirping along like I was going to rip him out of his shell and have him for dinner! Not only was he chirping, but he was curled tightly into his shell and sticking his big defense claw out. I continued to hold him and gradually he quieted down. For the next two days or so, each time I would pick up Big Mouth he would chirp, a little shorter each time. Now he is one of the quietest, happiest, most friendly hermit crabs I own. While I may miss his deep bass voice, I realize that he is much more at peace than he was when I first found him. Attila, the "work in progress." Attila is easily one of my biggest challenges as a crab owner. I bought Attila from a pet store that was keeping their crabs in a bird cage. He was pinched tightly onto the bars of the cage and, as with Grumpy, Attila was a 'mercy purchase.' To be honest, Attila is mean. He will not come out when I am around. When I pick him up, he sticks his wide-open big claw out at me. The only time I've seen him out was after his molt, when he came out to eat his exoskeleton. But since then, he is back to his 'old self,' the totally unrepentant C-R-A-B!! Because I own over 90 hermit crabs, Attila's behavior doesn't bother me, but if I only had four and one of them was a crab like him, it would be difficult. In that case I would not 'get rid' of the mean crab or take him back to the pet store, but would purchase another, more friendly crab to play with. I do not believe in taking 'mean' crabs back to the pet store (and almost certain death), since it is usually partly the pet store's fault the crab is so stressed and angry to begin with. Normal crab-to-crab behavior. Hermit crabs normally act with each other in standard ways, by crawling over each other, by having "feeler fights" or "pushing contests." Both feeler fights and pushing contests are normal crab behavior and are not cause for alarm. When crabs are having "feeler fights," they are actually smelling each other. Pushing contests, also, are a way they get acquainted. They will run up against each other and wildly wave their antennae and sort of "flick" their legs and claws out at each other. 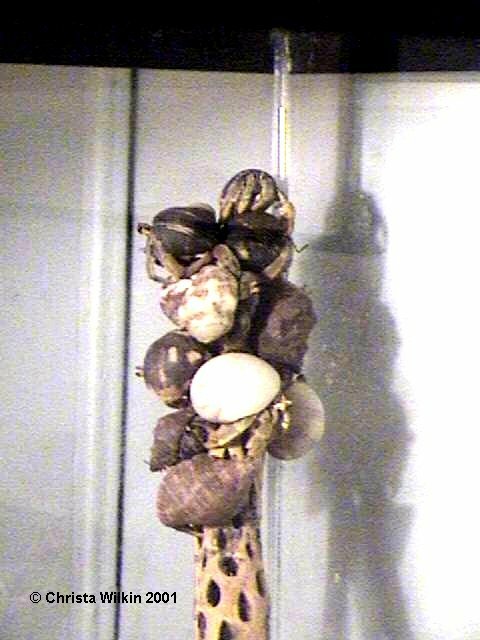 Hermit crabs seemingly do not understand the concept of "going around" an object -- they will try to dig under or climb over it. That is why they have these "feeler fights" and "pushing contests," because they cannot comprehend walking around an approaching crab. The behaviors listed above are harmless, unless you see one crab grab the other's shell by the opening and start pushing it back and forth and chirping. That usually signals a shell fight. Crab-on-Crab Violence. Grumpy, Big Mouth, and Attila were not friendly to human beings, but perfectly civil to the other hermit crabs in their crabitats. There are some crabs that are not. Land hermit crabs have been known to kill each other in various ways; mainly by either ripping each other apart or out of their shells, or by digging up molters and literally "eating them alive." 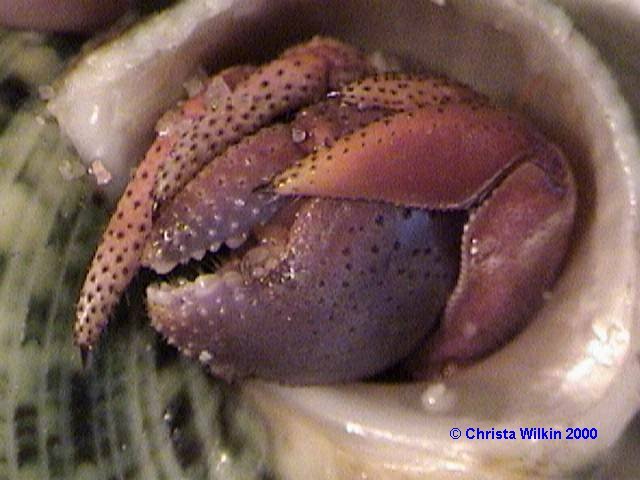 Hermit crabs are first scavengers and therefore will readily eat their own kind. As you can imagine, these situations are very disturbing to the crab owner. The usual scenario is you find a bunch of legs strewn around your crabitat, or you find one crab living in the "victim's" shell and the victim either walking about shell-less or already dead. If the victim is shell-less, then immediately isolate him with a shell comparable to the one he just lost in the fight. Rinse any sand or gravel off its abdomen and follow the instructions on the FAQ page for putting a naked crab back into its shell. If it is injured and still in its shell, isolate it in a warm, moist area. If the crab is healthy enough, it will pull through on its own. Remember that in the wild hermit crabs do not have 'owners,' yet they deal with these types of things all the time. Therefore, when a crab is injured or naked, you should disturb it as little as possible. My hermit crab is mean or does not come out of his shell for me. What can I do to make the crab ‘nicer?’ Hermit crabs, like people, have different personalities. Some crabs never seem to go all the way "in" their shells; some crabs you never see "out" of their shells. I’ve never had a complaint about someone whose crab comes out too much, so I’ll address the problem of a crab that won’t come out. Probably the best way to get the crab to come out is to hold it. Don’t spray it with water, just let it sit in the palm of your hand. Eventually, some of the warmth from the your hand will seep through the shell of the crab and the crab will start to ‘fidget’ and eventually come out. Some crabs won’t come out until they’ve been held a very long, long time. Some crabs will wait a little while and then reach out with the big claw and attempt to pinch your hand -- keep your palm stretched flat! Crabs ‘fresh’ from the pet store are even less likely to come out, because more than likely they’ve been poked, prodded and generally harassed by everyone who looks in their cage. Once you get the crab to come out, talk to it in a low voice. Keeping your hand flat (and your skin taut), allow the crab to walk around on your outstretched palm. Do not allow it to get into a position where it feels it may fall, or it will pinch you. Also, do not make any sudden movements or the crab will become frightened. Keep in mind that to a land hermit crab, any shadow passing overhead is a potential seagull looking for a meal of crab eyeballs! Once you realize the crabs' very real natural fear, it helps you appreciate what you’re asking the crab to do – come out of its protective house in the daytime, when most of its predators are about. When a crab comes out of its shell waving its big claw around, or tries to ‘dig’ into your hand with the big claw, just keep the skin taut and eventually curiosity will prevail and the crab will come out. Another method people use for getting a crab to come ‘out’ is to blow on it. That is not always a good idea – I’ve heard stories of people who’ve blown on a crab, and before they knew it, the crab had popped out of its shell and pinched onto their lower lip. If all else fails, you can lightly mist the crab with dechlorinated water. Do not mist the crab until it’s dripping. That will only annoy the crab and leave you with a sloppy mess. Most crabs, if they need any misting at all, will respond to two or three quick spritzes.